As with all new years, it seems, I am trying to focus on healthy cooking and losing a few pounds. I am not much of a fast food junkie, but I do like some of the breakfast items on the menus. 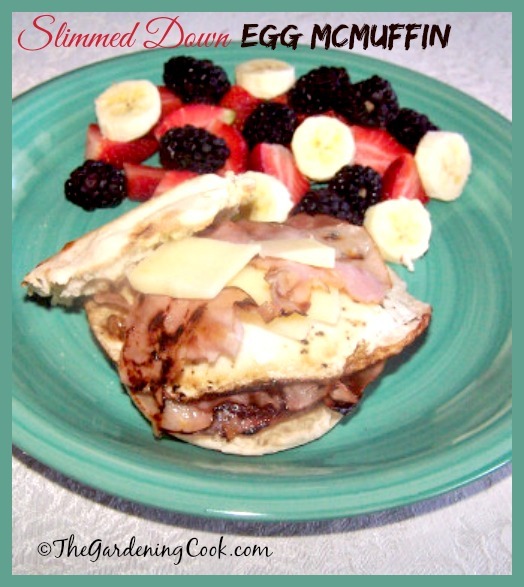 This healthier version of an egg McMuffin tastes great and won’t break the calorie budget and makes a healthier breakfast choice. Low Calorie Egg McMuffin Makes a Great Breakfast Treat. The recipe contains no added fat. I make use of Cabot reduced fat cheese, and use a healthy version of very thinly sliced deli ham instead of bacon or sausage to save calories. You can use whole grain English muffins to add extra fiber if you would like. An olive oil mister keeps the fat to a bare minimum. After cooking the deli ham and egg comes the fun part. Remove the English Muffin and start layering. I slice my one ounce of cheese very thinly so I end up with about 6 pieces of thin cheese. Place some cheese on the muffin. Add a slice of ham and more cheese. Put on another slice of ham, some cheese and the egg. Cover the egg with more ham and top with the last slice of ham. At this point, I put on the top muffin slice and push down. The heat from the cooked ingredients melts the cheese slightly and the egg makes a gooey mess. If you don’t like runny yokes and the mess, just cook the egg a little longer. 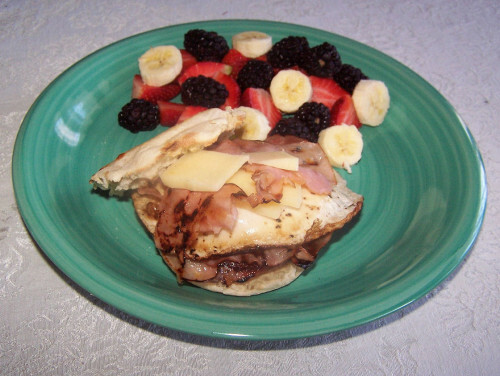 Serve with some sliced fruit for a healthy Egg McMuffin breakfast. My version is similar in calories to the lightest fast food breakfast choices, but so much more healthy and tastes a LOT better. Do you have some fast food make overs that you would like to share? Please leave your ideas in the comment section below. For more great ideas to get you started in the morning, check out these tasty breakfast recipes. Light spray from olive oil mister in a non stick pan. Very lightly spray a non stick pan with a spritz from an olive oil mister or can of Pam. Add the sliced ham and cook for just a minute or so on a medium high heat. Start the toaster with the English Muffin. Flip the ham over and add the egg next to it in the same pan. Season with salt and pepper. Cover and cook until the egg is as you like it. I like my yokes runny so the egg only needs to cook for about a minute or so.